I died taking a picture of a rainbow. I didn’t mean to. It happened at Target. In the parking lot. You don’t wake up thinking I may die today and it will probably involve a rainbow but that’s exactly what happened to me. I remember lying on the black wet asphalt as my vision of earth spiraled ever smaller until it was a pinpoint and then it was gone. I couldn’t move. My eyes were open. I couldn’t speak. I just kept staring straight up at the rainbow. It had been a really lousy month. But today I woke up feeling optimistic, the first time in a while. I was here because my cats were out of cat food and my kids needed milk for cereal tomorrow. John’s teacher had requested a bag of M&M’s for a math project. My husband had left us the week before and I didn’t work, I was often reminded. I wasn’t sure how we were going to make it. I had just gotten out of the car, list in hand and was walking towards the entrance of Target. And that’s when I saw it. Out of the corner of my left eye, I saw the tail end of the rainbow. I turned my head and followed it with my entire vision. It was magnificent. 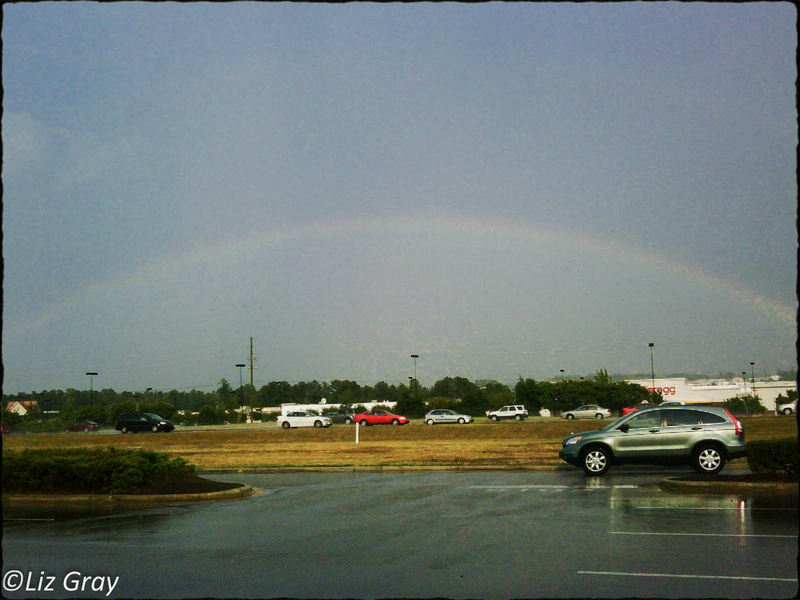 It was the biggest most vivid rainbow I had ever seen. Red, orange, yellow, green, blue, indigo, and violet colors literally popped out of the bluish black sky in an arch sweeping the entire landscape. I stopped in my tracks and fished my I-phone out of my pocket. A quick click and…. Tires squeeled. BAM! No time. In a fraction of a second, I was completely airborne. A Brinks truck driver didn’t see me. The driver probably for one second forgot about the cash bags he was about to pick up and was instead focused on the rainbow. Where was I? What’s happening? My phone flew out of my hands a good twenty yards. It landed unseen and abandoned under a crumpled Starbucks cup that was lying on the ground under a tree, an island refuge in a sea of cars. No one saw the phone with the rainbow as its final image. Two other people walking towards the entrance watched in horror, put their hand to their mouth, and stood shocked still for a moment before running over to help me. It was too late. John and Sophie would be getting off the bus in another hour. I wouldn’t be there to greet them. Robert was kissing the neck of his secretary and didn’t know this was happening to me, but it would soon happen to him too. The cats would not eat until the next day even though they were hungry when I left. They would have lunchmeat and not cat food. John’s teacher would have to use counters instead of M&M’s for her math lesson the next day. John would not be there; both wouldn’t even notice there was no milk because they would wake up at their Dad’s apartment, after being picked up late the night before at my neighbor’s house. Where was Mom? They anxiously wondered for four hours! Yes, it’s true. Your life flashes before your eyes. You remember everything. All of the good and all of the bad. Seeing your life in review, it’s so crystal clear now what you should have decided at each critical moment you weren’t certain of then. I wasn’t sad. Or worried. Or mad anymore. I didn’t have enough time left to know if Sophie and John would be okay living the rest of their life with Robert and his secretary-ultimately-turned-stepmother to my kids. It wasn’t in my power anymore. I’m in heaven now. And it’s so beautiful. There are no words to explain what it’s like. Now I look down sometimes and see rainbows. I see each pixel of color as it pours out like liquid. I can almost taste the difference between molecules of red and indigo. Did I die doing something I loved? It’s hard to say; certainly I loved my kids so much more than any digitized memory of something beautiful. Certainly I died seeing something I loved, and feeling a love that doesn’t exist on earth. I’m part of that love now; it’s as big as the universe and it goes on and on. It’s not constrained by conditions; it’s unlimited. Time takes on a different meaning. I can be patient now. I have all the time in the world. For now, I wait and I watch. I have so many happy reunions to look forward to. We all make plan, for today, and for our life. We plan our careers, family, finances, dreams, and we hope for our future. But sometimes God throws us a curve ball. The one we don’t see coming changes everything. Today is Friday. I’ve been in heaven three days. Two teenage boys are popping wheelies on their bikes in the Target parking lot. One of them gets tired and takes a brief respite and sits down on the curb of the tree island. He leans back on his hands behind him. That’s when he finds it. His left hand bumps into something hard under a light layer of pine straw. It’s my phone. Five years of digital memories of my kids. And one magnificent rainbow. Will he do the right thing? Will he call home? What will he think about all my pictures? Will he see them at all? I smile as I see him successfully turn it on and watch from above as he starts to scroll through the various menus. You have no idea I think. Absolutely no idea.